Verdict: 3.5 / 5The finish of this title is one that leaves a lot of room for thought. The Flash continues to deal with the consequences of the last chapter of chaos his family have encountered. With Wally West all but fractured, Iris trying to piece together a life she cannot remember, Kid Flash feeling like a forgotten member of this team and Barry himself struggling with what comes next, each member of this family is on their back foot, swinging wildly. 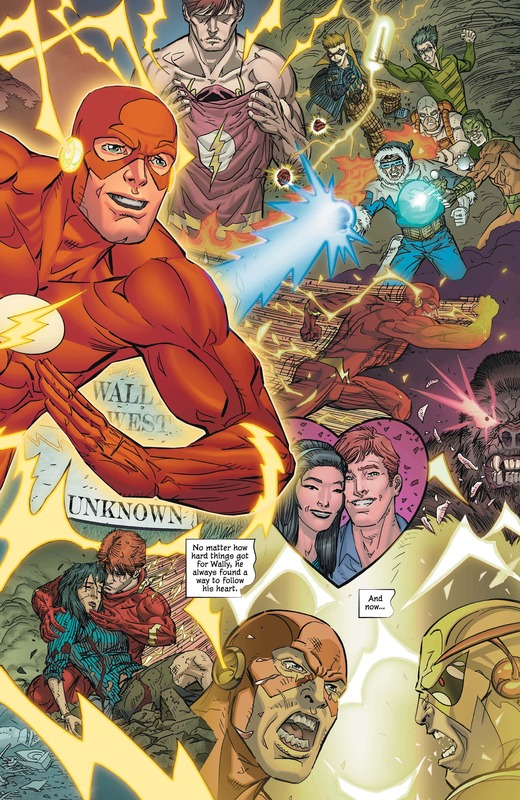 The Flash War has truly weakened what’s left of the team, but it is The Flash’s trademark hope that will continue to bring these broken people together once again. For Wally, his promise to never stop running is more of an emotional escape, one that cannot be maintained forever. His purpose to find his kids has become far more difficult now that the rules of the Universe have changed for the speedsters. 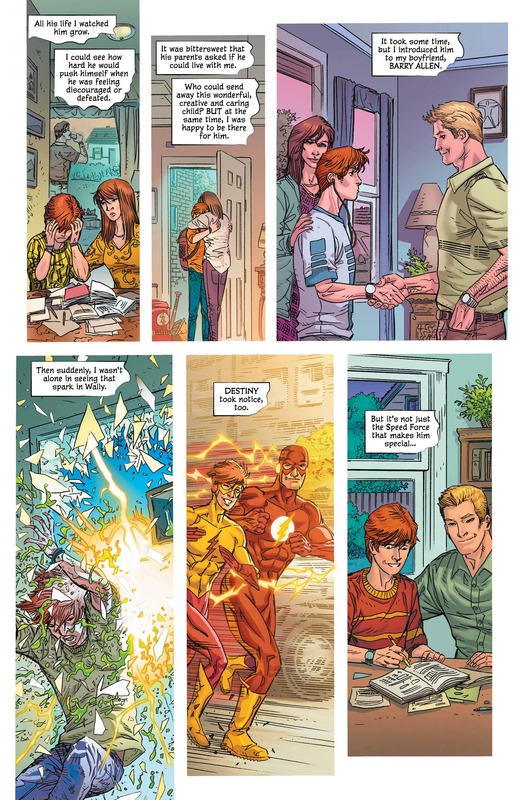 With very little understanding of how to help them, Wally resorts to burning himself as a hero, helping those he can, but never truly giving up the search until he cannot run any longer. Barry struggles with this, knowing that Wally will eventually collapse from both physical and emotional exhaustion. However, it is Iris who pulls him back, allowing Wally to finish the journey he has started on. Iris’s quest to start writing down her memories is an intriguing subplot that is sure to play into many stories to come. Iris’s quest to start writing down her memories is an intriguing subplot that is sure to play into many stories to come. This useful technique of calling on the past should intertwine with the current narrative that is being pushed in the present Flash book. Elsewhere, Commander Cold has been given the chance to set up a life in the present day, whilst they find a way to return him to the future. Kipping on the Flash’s sofa means he’ll constantly be in the centre of the action, with the Commander becoming a bigger supporting player, especially as other members of the team break away. One such member is Kid Flash, who has clearly found a home elsewhere. The tension had been building for a while now and whilst it’s probable that Kid Flash will return, Barry is the only speedster on the team once more. That leaves me with the final fate of Wally, who is taken by Wonder Woman and Superman to The Sanctuary, a brand new facility that was created to deal with the emotional woes of the DC Universe’s heroes. The finish of this title is one that leaves a lot of room for thought, with Batman and The Flash wondering how long it’ll be before they too are shipped off to this remote location to recover from a lifetime of trauma. It is a fantastic idea that has been implemented across DC titles and we are going to be seeing a lot more of this in the future. The Flash #51 was the next step in a larger story. Although not groundbreaking in its own right, we are now familiar with where the series will take us next, with some old members leaving and some new ones inbound. Who our next villain will be remains to be seen, but the sanctuary now looms over our heroes as the world continues to descend into chaos.